It isn’t just the finance and title deeds that need to have secure foundations in a property transaction. The legacy of our extensive mining industry combined with natural hazards means that understanding the ground below the property and its immediate vicinity is vital. Time and climate change are revealing previously unknown shallow mines or areas of softer bedrock, which could open up gardens lawns or leave the foundations exposed. Conveyancers need to highlight potential subsidence risks to their clients so that they can avoid the trap of limited or no insurance or very high excesses and disruption should the worst happen. 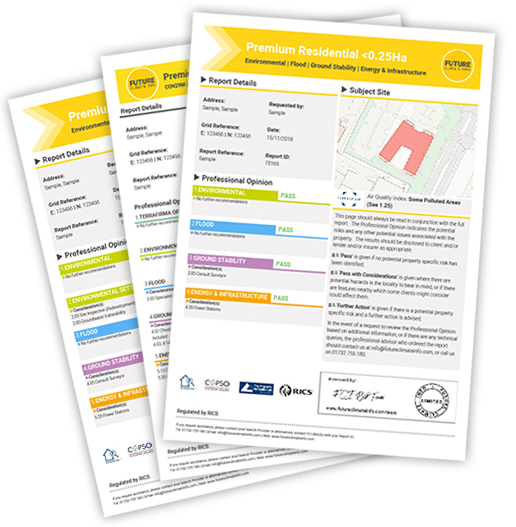 Our unique partnership with Property Assure provides highly accurate, postcode specific risk analysis, backed up with more detailed site surveys to verify whether it could affect your client before they commit to the transaction. We have joined forces with Terrafirma to deliver an innovative new desktop search; combining the Premium Residential Environmental Report with Terrafirma’s new official CON29M coal mining search – essential data to understand environmental risk both above and below the ground. Analyses the key subsidence risks. Complete with an exclusive risk rating from Property Assure. If a potential subsidence risk is identified, our partner Property Assure can undertake a more detailed site survey, together with follow on sub-surface investigation, crack and level monitoring. Chalk Sinkholes: Are Ancient Mines Revealing themselves? The Bayfield estate in West Allotment, North Tyneside was built by Belllway Homes in 2011 as part of a larger development of several hundred houses on the east side of Newcastle near Shiremoor. Subsidence and cracking of several homes was first noticed in 2015. Families were originally evacuated in June 2016 and then permanently relocated in January 2017 after severe mining subsidence damage initially threatened five properties, which were initially cordoned off and investigations began to find out the cause of the ground movement. The Coal Authority set up a base on the estate and carried out detailed examinations over 14 months. Their investigation revealed unrecorded coal mine workings, which date back around 120 years. These showed the site had been extensively worked – usually, in this area, 45% to 50% of coal is mined, but in this case the amount of coal mined was over 70%. This over extraction resulted in narrow residual supporting coal pillars and wide extraction rooms in the high main coal seam, leading to compression on the remaining coal pillars and roof instability. Together with a weak sandstone layer and fracturing within the rock above the coal seam, this resulted in an underground collapse and subsequent movement of the properties above. Other potential causes for the ground movement, such as how the properties were designed and constructed, groundwater and the proximity of other quarries, were ruled out so that it was finally identified as an unrecorded mine entry. 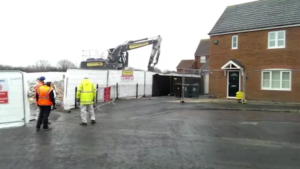 In January 2017, five houses on the estate were demolished, with a further 10 scheduled for demolition, costing £95,000, with a total housing development loss of value of around £3 million. After demolition, stabilisation work could then begin which would allow the area to be redeveloped. Grout was injected into the mine workings to fill the underground cavities and prevent further ground movement. This was followed by six months of further ground monitoring to ensure the ground was stable for redevelopment. Under the Coal Mining Subsidence Act 1991, The Coal Authority has liability for historic coal mining subsidence claims. These shallow mine workings were not documented by The Coal Authority and the risks were not evident during preliminary due diligence when the land was originally purchased or later when the houses were constructed. The Authority said, however, that for properties damaged by subsidence, it was only able to consider purchase of homes in cases where the cost of the damage outweighs the cost of repair. Families were distressed throughout, whether through forced evacuation or the uncertainty as to how widespread the subsidence extended and the disruption caused by the demolition and stabilisation of the land. All of these factors had impacts to local house prices and their enjoyment of their homes. They fear blight and the difficulty of selling their homes even in areas of the estate currently unaffected by subsidence is understandable.